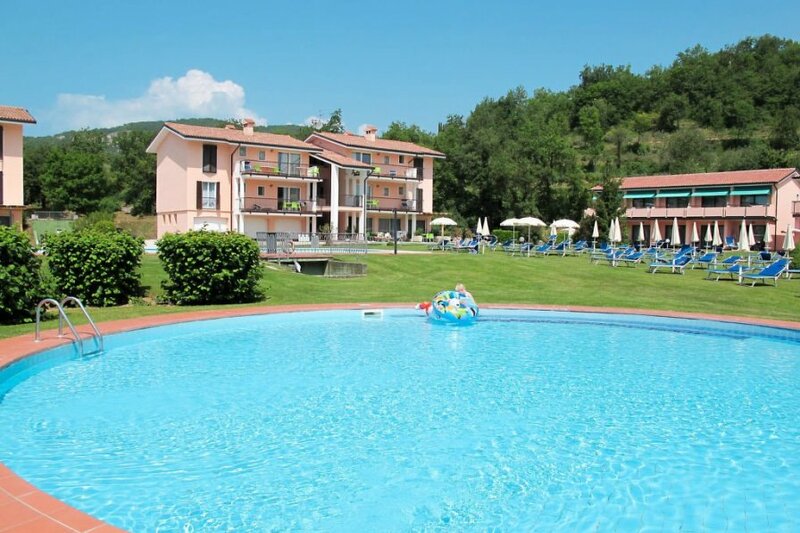 This 2 bedroom apartment with swimming pool is located in Costermano sul Garda and sleeps 6 people. It has WiFi, air conditioning and barbeque facilities. Apartment, 4 - 6 people, 3 room/s, 2 bedroom/s, 1 bathroom/s, approximately 55 m², 1 floor/s, apartment on ground floor or upper floors, separate access to the property. Feature: Property in a holiday complex (max 3 floor(s), 7 building(s) in total, 34 units in total). Equipment: satellite TV; internet access Wi-Fi (included); safe; gas central heating; air conditioning (not available in all rooms); air conditioning (on request). Heating if required, € 10/​day. Air conditioning (on request), € 10/​day. Holiday resort tax. Linen/towels available. Change of bed linen/towels, € 10 per person. Deposit € 70 (in cash). Cot € 6.50 per day (on order). High chair € 1.50 per day (on order). Pet 2 animals allowed, € 7 per pet and day (please advise prior to arrival). Estate (shared use with the owner and holiday guests): approximately 2 ha, closed plot (fence), flat, trees, with plants, with garden, well-kept. Outdoor facilities(shared use): reserved open space (roofed), transportable barbecue. Pool (shared use): 20.0 x 8.0 m, 1.50 m deep, open throughout the entire season, depending on the weather, children's pool. Pool area: lawn for sunbathing, sun loungers, sunshades. Pool 2 (shared use): O 12.0 m, 50.00 m deep, open throughout the entire season, depending on the weather. Shared use (free of charge): football pitch, children's playing equipment. Infrastructure: bakery service; washing machine (coin-operated). Terrace 17 m² (roofed), balcony 17 m² (roofed), furnishing provided, sun loungers. The apartment is described as good value for money. This apartment is located in Costermano sul Garda. It is set in a convenient location, just 0 metres away from a beach and 4km away from the city center. There is a golf course nearby. The apartment is suitable for family friendly summer holidays.